There’s a term kicking around the new Networked Narratives course that I keep referring to and which I am curious to get to in the coming weeks: Civic Imagination. Mia Zamora hints at this a bit with her posts over at DML about the Networked Narratives course that is a hybrid between a university class and an open course (with Alan Levine), with the theme of digital storytelling. 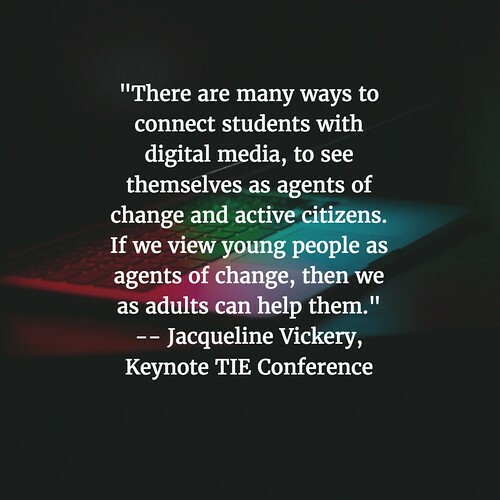 Mia’s terminology was on my mind yesterday as I listened to a keynote presentation by Jacqueline Vickery, a professor and researcher out of Texas, during a local technology conference that I attended. Vickery’s focus in her talk was about engaging students as citizens in the Digital Age, and how adults often thwart those moves by teenagers to engage with the world through fear and intimidation. Vickery’s talk reminded me of the deep work by danah boyd, too, and how we need to pay attention to the “stories” of our young people, and help them find ways to positively engage with the world through social media and other technology/communication avenues. Vickery (who has a book coming out called Worried about the Wrong Things: Youth, Risk and Opportunity in the Digital Age) noted that her research comes from observing young people interacting with technology. Many adults — parents and teachers and public policy makers — often react without taking the time to understand the underlying issues, or what is really taking place between youths when they connect. 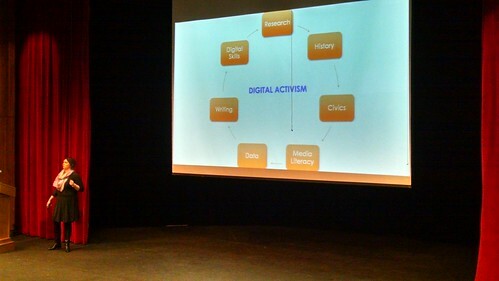 Vickery laid out some tenets of helping young people see themselves as Citizens of the Digital Age (see image above), where social interaction across the technology is a vital component for participatory media and connections, for the betterment of the world. Probably not, in my estimation. And this brings me back around to Mia’s reference to the term of Civic Imagination, and it has me wondering how we help students envision a better world ahead of them, and then how to turn that imaginative yearning into reality through awareness, information, agency and engagement with the world. This is the whole underlying premise of Connected Learning, by the way. Vickery didn’t dispute that there are places where young people need help and oversight from adults to navigate the tricky waters of technology, but overall, she remains positive about the choices and the actions of young people. This entry was posted in CLMOOC, NetNarr, Technology Resources. Bookmark the permalink. This is critically important as we move through the future.